Courses for an online bachelor’s in child development degree examine the period of growth from birth to adolescence. Pursuing a child development degree online is a convenient option for professionals hoping to transition into a managerial or teaching position. The degree studies sociological factors that influence learning and well-being. Students graduate with the expertise needed to seek employment as a preschool teacher, social service provider, or childcare worker or director. The Bureau of Labor Statistics projects that careers in social and human service will grow 16% over the next decade, and that the economy will add more than 50,000 preschool teaching positions by 2026. University of Alabama ranks #1 on The 20 Best Online Bachelor's in Child Development Programs! The University of Alabama offers an online BS in human environmental sciences, human development, and family studies. The program is designed for students who currently work for or intend to work for a Head Start agency. Located across the country, Head Start agencies provide social and educational guidance for children from low-income families. Graduates work in participating schools, children's centers, and family planning centers. Students earning their child development degree online from Alabama learn the social, physical, and cognitive development stages of young children and explore the parent-child relationship. Students learn to design, implement, and evaluate children's educational programs. The fully online bachelor's degree comprises 120 credit hours and has no on-campus requirements. Applications are accepted on a rolling basis. Alabama awards credit for prior learning, which is subject to evaluation. The University of Alabama is regionally accredited by the Southern Association of Colleges and Schools Commission on Colleges. Pennsylvania State University-World Campus ranks #2 on The 20 Best Online Bachelor's in Child Development Programs! The nation's growing population of older adults has led to increased demand for family services and childcare professionals. Penn State's online BS in human development and family studies explores how people change from birth to old age and how families and communities influence these changes. Students apply this knowledge to the development, implementation, and evaluation of interventions and programs to improve people's lives. Graduates of Penn State's online child development degree advocate for social programs and policies. Students learn to develop models for the prevention and treatment of social, behavioral, and emotional problems in children and adults. Penn State has offered fully online programs for nearly 10 years. The online degree in child development has no in-person requirements. Penn State also offers online certificate programs in children, youth, and family services and in adult development and aging services. Students can apply credits earned during associate and certificate programs toward the bachelor's degree. Penn State is regionally accredited by the Middle States Commission on Higher Education. Oregon State University ranks #3 on The 20 Best Online Bachelor's in Child Development Programs! Located in Corvalis, Oregon State offers a BS in human development and family sciences. The online bachelor's program examines human development in relation to family, community, education, and cultural environments. OSU's online degree in child development combines practice and theory to prepare students for careers in social justice. The curriculum emphasizes critical thinking, writing, and research skills and equips students to pursue graduate studies in counseling, education, psychology, and social work. OSU encourages human development students to pursue a minor in public health, psychology, leadership, or sociology. Graduates of OSU's BS in human development program secure positions as youth program specialists, community activity directors, marriage and family coordinators, and childcare coordinators. All classes are available fully online and are delivered asynchronously; students complete coursework at their convenience. Most students earning their child development degree online from OSU complete the 180 required credits in four years. Online learners follow the same curriculum and learn from the same instructors as on-campus students. Online students have access to success counseling, online tutoring, and library services. Oregon State is regionally accredited by the Northwest Commission on Colleges and Universities. Washington State University ranks #4 on The 20 Best Online Bachelor's in Child Development Programs! WSU's BA in human development program focuses on how families and individuals are connected to social groups and broader communities. Students learn how to help individuals of all ages handle challenges and develop skills. After earning their child development degree online, WSU graduates work in programs such as Head Start, preschools and childcare centers, and the YMCA. Many students in the bachelor's degree in human development program earn certification in gerontology or early childhood education, the latter of which is only available to Washington residents. The curriculum covers child assessment and evaluation, families in poverty, and gerontology, and the program culminates in an integrative capstone project. All undergraduate students at WSU complete university common requirements; a direct-transfer agreement generally covers these credits. Applicants must have completed 24 college credits with a cumulative GPA of 2.35 or better. Distance learners have 24/7 access to course materials. Online students complete coursework, stream lectures, contribute to class discussions, and access library materials asynchronously. Washington State University is accredited by the Northwest Commission on Colleges and Universities. University of Washington ranks #5 on The 20 Best Online Bachelor's in Child Development Programs! Based in Seattle, the UW offers a fully online BA in early care and education that can be completed on a part-time or full-time basis. The online child development bachelor's program prepares students to pursue careers in education, mental and social health services, parent support, and childcare. The curriculum blends academic theory and research in childhood education with practical field training. Students earning the UW's 180-credit BA in child development online learn through traditional teaching styles and through observation, action, and reflection. Students spend time in classroom settings, observing children and early childhood professionals. Students can specialize the degree with one of two pathways: the core pathway or the teaching and learning pathway. The core pathway provides a foundation in childhood topics, while the teaching and learning pathway includes coursework specific to childhood learning. Most students graduate after two years of full-time study or three years of part-time study. Online students have 24/7 access to course materials. Students begin and finish each course with a cohort of peers. All distance learners must meet the same deadlines and must stay up-to-date on assignments and lectures. Applicants must have at least 70 credits from a four-year institution. The UW is regionally accredited by the Northwest Commission on Colleges and Universities. University of Massachusetts - Amherst ranks #6 on The 20 Best Online Bachelor's in Child Development Programs! UMass offers an online BA in children's learning and development that provides knowledge and skills necessary for careers in childcare, child advocacy, education, family planning, and youth programming. This online degree in child development is designed for students who plan to work with agencies dedicated to serving children and families. Coursework covers multicultural education, behavior management, child psychology, and teaching methods. While this is not a licensure program, UMass offers courses to prepare students for preliminary licensure in Massachusetts. UMass allows distance learners to develop their own program of study in children's learning and development. Through the Without Walls format, students can earn up to 100 credits for previous coursework, prior learning, and life or work experience. UMass also awards credit for Montessori training. The BA in children's learning and development is available asynchronously, with no on-campus requirements. Applicants must have at least 12 college credits and a GPA of 2.0 or better. Applicants must not hold a bachelor's degree from a U.S. institution. Residents of Alabama and Arkansas are currently ineligible to apply for this online program. The university offers start dates in September and January. UMass is accredited by the New England Association of Schools and Colleges. Colorado State University - Fort Collins ranks #7 on The 20 Best Online Bachelor's in Child Development Programs! CSU's online BS in human development and family studies prepares students to assist families and individuals during various stages of life. This customizable program provides field experience and internship opportunities. Coursework focuses on the changes people undergo throughout the course of their lives and the influence of communities, families, and societies on human development. The curriculum covers topics such as biology, sociology, and social work to provide students with a multidisciplinary understanding of human development. Students choose from five concentration options: early childhood professions, leadership and entrepreneurial professions, prevention and intervention sciences, pre-health professions, and human development and family studies. After earning the child development degree online, graduates pursue positions in early childhood services, programming for older adults, community outreach, and adolescent information. All coursework is available entirely online through Canvas. Distance learners have access to recorded lectures, live on-campus classes, assignments and tests, and peer discussion boards. Students have no set login times, but learners complete several collaborative projects. Online classes are taught by the same faculty as their on-campus counterparts. Colorado residents can complete the program in a hybrid format, with some on-campus classes. Students complete 120 credits, and transfer students can submit previous coursework for approval. CSU is regionally accredited by The Higher Learning Commission of the North Central Association. Arizona State University ranks #8 on The 20 Best Online Bachelor's in Child Development Programs! ASU offers a BS in family and human development that covers human development throughout the duration of an individual's lifespan. Students gain an understanding of the development, formation, and dissolution of families. Graduates work in counseling, medicine, law, and social work, and many pursue graduate degrees. The curriculum covers topics such as marriage and family relationships; the impact of ethnicity, parenting, and work on family interactions; and individual development. Online course materials are delivered asynchronously and are available 24/7. Students complete 120 credit hours over terms lasting seven and a half weeks. ASU's online degree in child development is available fully online. All applicants must have a minimum 2.5 cumulative GPA from high school or college coursework. Freshman applicants must have graduated in the top 25% of their class or have a GPA of 3.0 in all competency courses. ASU is regionally accredited by The Higher Learning Commission of the North Central Association of Schools and Colleges. 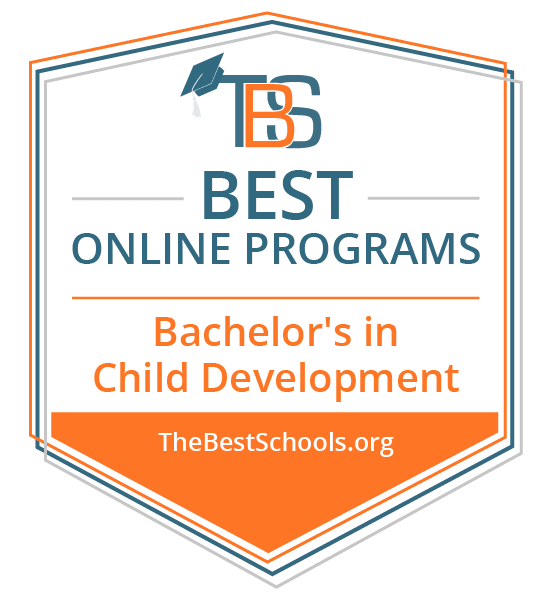 University of Wisconsin - Stout ranks #9 on The 20 Best Online Bachelor's in Child Development Programs! UW–Stout offers a fully online BS in human development and family studies program that explores the intricacies of child development and the development of families, communities, and societies. The online child development degree prepares students for careers in human services, including residential treatment programs, group homes, family resource centers, youth summer camps, and childcare facilities. Many graduates earn master's degrees in fields such as social work, health and wellness, family science, and counseling. Students are encouraged to double major with a BS in early childhood education. Most students also earn a certification in family life education or social work training. UW–Stout's online degree in child development is designed for students with an associate degree or its equivalent, who possess a background in childhood or family education. The program is available completely online and can be completed on a part-time or full-time basis. Students who accelerate the program can earn the degree in as few as two years. Distance learners have 24/7 access to course materials, including lectures, notes, and student-led discussion boards. Approximately 90% of graduates are employed in a relevant position or are pursuing a graduate degree in the field. UW-Stout is regionally accredited by the Higher Learning Commission. Concordia University ranks #10 on The 20 Best Online Bachelor's in Child Development Programs! Located in St. Paul, Minnesota, Concordia offers an online BA in child development with a focus on teacher education. Students learn practices appropriate for various stages of children's development and apply theory to advocacy and leadership experiences within the field. Coursework adheres to the standards for initial professional preparation as specified by the National Association for the Education of Young Children. Students learn to define developmentally appropriate practices for children and understand how families serve as primary caregivers, instructors, and models. Students develop a framework for making moral choices while working with young children. Distance learners complete fieldwork in a licensed childcare or childhood learning center, which involves teacher interviews and observation of staff and children. Students earn Concordia's child development degree online with no on-campus requirements. However, Minnesota residents can pursue the degree in a hybrid format. The program requires 42 credit hours, and each course lasts seven weeks. All course materials, including lectures, notes, and readings, are available online 24/7. Students complete assignments and projects asynchronously, but are required to participate in weekly discussions. Concordia is regionally accredited by The Higher Learning Commission. North Dakota State University ranks among The 20 Best Online Bachelor's in Child Development Programs! Through NDSU's BS in human development and family science with a concentration in child and adolescent development, students learn how children develop through interaction with society and family. Students can focus on understanding and meeting the needs of older children and adolescents or on promoting child protection and health. Most graduates of NDSU's online child development degree program pursue careers providing either direct or support service to children and families. Direct service careers include roles as community service workers, parent educators, extension agents, and financial counselors, while support service professionals hold positions as childcare directors, consultants in human development, and child advocates. Many graduates pursue further education in counseling, family development, or family therapy. Students complete 122 credits, including an internship. All classes are available fully online, and NDSU has no residency requirements for distance learners. Most full-time students graduate in four years; those who complete a summer quarter can graduate in as few as three years. NDSU accepts transfer credit, but students must earn at least 36 credits through the university. NDSU is regionally accredited by the North Central Association of Colleges and Schools. Eastern Kentucky University ranks among The 20 Best Online Bachelor's in Child Development Programs! Based in Richmond, EKU offers a BS in child and family studies with a concentration in child development that prepares students to become leaders in the human development and family service fields. Students gain skills needed to leave positive and lasting impressions on children from all backgrounds. Courses cover topics such as interaction and guidance, family involvement, ethics and advocacy, and early childhood observation and assessment. EKU offers certifications in early childhood direction and in infant-toddler care and education. Students can pursue a minor relevant to their interests and career goals. Graduates become public and private preschool teachers, early childhood educators, curriculum specialists, and childcare specialists. Students complete 120 to 125 credit hours. The bachelor's program is available fully online, and distance learners have 24/7 access to course materials. All online courses are taught by the same instructors as their on-campus counterparts. All online students pay the same tuition rate, regardless of state residency. Classes are delivered in eight-week terms, with six start dates per year. Freshman applicants must have a cumulative high school GPA of 2.5 or better and must meet required ACT or SAT scores. Transfer applicants must have a minimum 2.0 college GPA. EKU is regionally accredited by the Southern Association of Schools and Colleges Commission on Colleges. Hope International University ranks among The 20 Best Online Bachelor's in Child Development Programs! Based in Fullerton, California, HIU offers a BS degree in human development with two concentration options. Students who pursue the community mental health and counseling concentration study the theory of counseling, mental health interventions, consultation, and abnormal psychology. Graduates with this concentration work in mental health institutions, employee assistance programs, policymaking settings, and forensic settings. The family studies concentration covers topics relating to the physical, social, and cognitive development of children and young adults. Graduates pursue careers as adoption caseworkers, daycare directors, counselors, elementary school teachers, and child life specialists. Both concentrations include an academic core of leadership and ethics coursework. HIU's online child development degree requires 120 credits and is available entirely online. Distance learners receive the same personal attention as on-campus students. Online courses utilize real-time interaction with professors, video lectures, and discussion boards. Students complete weekly assignments. Applicants must submit high school transcripts and must have at least a 2.5 GPA or a GED score higher than 47. Transfer applicants must have a 2.0 GPA. HIU is regionally accredited by the Western Association of Schools and Colleges Senior College and University Commission. West Virginia University ranks among The 20 Best Online Bachelor's in Child Development Programs! WVU offers a fully online BS in child development and family studies that prepares students to assist in the academic, cognitive, and social development of preschool children. Students learn best practices for working with young children while focusing on leadership and advocacy. Students earning the child development degree online complete education requirements established by West Virginia's educational agencies. Students can specialize in child development, which does not lead to certification, or in preschool education-birth-four, which leads to pre-K certification. WVU's curriculum adheres to standards set by the National Association for the Education of Young Children. Online classes are delivered asynchronously through Blackboard. Distance learners have 24/7 access to lectures, study materials, assessments, and online counselors and communicate with classmates using chat rooms and discussion boards. Freshman applicants must have a minimum high school GPA of 2.5 or a comparable GED score. WVU is regionally accredited by the Higher Learning Commission. Southern New Hampshire University ranks among The 20 Best Online Bachelor's in Child Development Programs! SNHU's BA in psychology with a concentration in child and adolescent development teaches students how children develop from birth to adolescence. Students gain experience needed to work with children in settings such as schools and hospitals. SNHU's online bachelor's in child psychology provides an in-depth view of the physical, psychological, social, and cognitive needs of young people. During interactive classes, distance learners participate in class discussions, complete research projects, and engage in experiential learning opportunities. The curriculum includes optional specialized research projects to help students gain professional experience. The bachelor's degree prepares students for graduate studies in psychology and social sciences. This private, nonprofit university offers a flexible online format; all lectures, notes, reading materials, assignments, and assessments are accessible 24/7. Online students can enroll on a part-time or full-time basis. Classes are delivered eight-week terms, and SNHU accepts applications prior to each new session. The university allows high-achieving distance learners to join honor societies, including Psi Chi, an international psychology-based community. Transfer students may bring 90 previous credits. SNHU is regionally accredited by the New England Association of Schools and Colleges. The University of Texas of the Permian Basin ranks among The 20 Best Online Bachelor's in Child Development Programs! UTPB offers a fully online BA in child and family studies with a concentration in learning and development. This bachelor's degree completion program is ideal for students who plan to work with families and children. The learning and development concentration focuses on the cognitive, physical, emotional, and social development of young children and explores issues related to families and atypical childhood development. Many graduates obtain teacher certification or work with Head Start programs. The bachelor's program facilitates a smooth transition from community colleges, especially for students who have completed Texas Early Childhood Articulate programs. The online child development degree requires 120 credits of coursework in general education, child and family studies, psychology, sociology, and electives. Students must earn at least 30 credits through UTPB and must maintain at least a 3.0 GPA in all required classes. UTPB awards credit for prior knowledge in courses where proficiency can be measured through examination. UTPB is regionally accredited by the Commission on Colleges of the Southern Association of Colleges and Schools. Utah State University ranks among The 20 Best Online Bachelor's in Child Development Programs! USU's BS in family life studies is available exclusively online. The program prepares students for careers serving children and families. Students learn how family dynamics, economics, consumer issues, and human development affect families and individuals. Distance learners customize the degree through a capstone practicum. Students can earn the online child development degree on a part-time, full-time, or accelerated schedule. The fully online courses are delivered asynchronously, and students have 24/7 access to all course materials. Utah is a member of the State Authorization Reciprocity Agreement, but students should ensure USU's online child development degree is authorized in their state of residence. Online students have access to an academic advisor, the library, the career center, IT assistance, and USU's Center for Women and Gender. Freshman applicants must have a high school GPA of at least 2.5 or higher and mst meet ACT or SAT score requirements. Transfer applicants must have 24 to 60 college credits with a GPA of at least 2.3. USU is regionally accredited by the Northwest Commission on Colleges and Universities. Union Institute and University ranks among The 20 Best Online Bachelor's in Child Development Programs! Union's BS in child and adolescent development program focuses on the emotional, social, affective, cognitive, and physical development of children from infancy to adolescence. Union's online child development major takes a comprehensive approach to working with families and children by preparing students for various career paths. Graduates work in a variety of health, education, and human services settings. Distance learners have access to a learning community composed of child development professionals. While the majority of coursework is available online, some required credits are only available at Union's Sacramento or LA campuses. Online classes are delivered asynchronously, but students must meet weekly deadlines. Classroom materials, including lectures, notes, and virtual assignments, are accessible 24/7. Students can complete the program on a part-time, full-time, or accelerated schedule. The online child development degree requires 120 credits of general education requirements, psychology and sociology classes, and elective coursework. Freshman applicants must submit high school transcripts or GED scores and SAT or ACT scores. Transfer applicants can submit up to 90 credits from a four-year institution. Union is regionally accredited by the Higher Learning Commission. San Diego Christian College ranks among The 20 Best Online Bachelor's in Child Development Programs! Based in Santee, California, SDC is a Christian institution that prepares students for careers in fields such as social services, counseling, and human resources. SDC's online BA in human development provides interpersonal skills to help students become socially impactful members of their communities. Students earning the child development degree online complete coursework in lifespan development and explore individuals' cognitive, social, spiritual, moral, and personality development. Students can pursue a minor or concentration in an area such as education, leadership, or psychology. Graduates pursue positions such as crisis center staff member, human resources professional, and early childhood center director. The program is available in fully online and hybrid formats. Courses are delivered in five-week terms, with start dates throughout the year. Most students complete the 123 required credits in four years. Applicants must submit official high school transcripts and, if applicable, college transcripts. SDC is regionally accredited by the Senior Commission of the Western Association of Schools and Colleges. California State University, East Bay ranks among The 20 Best Online Bachelor's in Child Development Programs! CSUEB offers a fully online BA in human development with three concentration options: adult development and gerontology, women's development, and early childhood. The curriculum for this online child development degree examines theories of human development and associated social, physical, cultural, and emotional dimensions. Students explore lifespan concepts and developmental issues regarding children, adolescents, adults, and aging populations. Graduates pursue careers in schools, hospitals, counseling, and family planning. Many graduates earn advanced degrees in public administration, social work, law, and gerontology. This degree completion program is designed for students transferring from a community college or returning to college after a period of academic inactivity. Distance learners have 24/7 access to course materials. Coursework is delivered asynchronously, but distance learners can pursue the degree in a hybrid format. Applicants must have a high school diploma or GED and must be in the process of completing or have completed a minimum of 15 college credits with a 2.0 GPA. The program adheres to a quarter system and offers start dates in fall, winter, spring, and summer. CSUEB is regionally accredited by the Western Association of Schools and Colleges. Curriculum requirements commonly found in an online child development degree focus on core skills required for jobs in childcare, teaching, and community health. Foundational coursework covers topics in physical and cognitive child development, language acquisition, and family and community relationships. Concentrations in areas such as special education, youth issues, or adolescent studies prepare students to work with specific populations. Some programs offer dual concentrations that offer additional training in child development, business management, or psychology. These complementary programs open students to additional avenues of employment like child welfare, juvenile delinquency, and nutrition. Degree requirements vary by program, and students may encounter practicum requirements, a capstone course, or professional seminars while finishing their online degree in child development. Field placement reflects a student's area of emphasis, and students fulfill practicum hours at a school, community agency, or mental health facility. In addition to acquiring practical skills, students enrolled in a child development degree online cultivate professional identities focused on ethical behavior and advocacy. Students who pursue their child development degree online work in a variety of child-focused environments. In addition to knowledge of the physical and cognitive developmental stages that occur in childhood, child development professionals possess strong communication and interpersonal skills. An online child development degree prepares students for the following occupations. Preschool Teachers: More than half of all preschool teachers work in a child daycare facility. Job duties in daycare and school settings include creating routines, developing lesson plans, and teaching basic skills, such as sharing, following directions, and participating in group activities. Earning a child development degree online allows preschool teachers to work in Head Start programs. Preschool and Childcare Center Directors: From ordering supplies to hiring staff, childcare center directors manage every aspect of their facility. They train staff members, implement programs, follow governmental regulations, and develop budgets. Coupled with experience, an online degree in child development provides students with the training needed to pursue leadership positions with childcare facilities. Social and Human Service Assistants: Social and human service assistants who earn their online child development degree work with children and families to meet their physical, mental, and emotional needs. Job responsibilities include developing plans for treatment, helping clients fill out forms, and assisting parents in finding childcare.